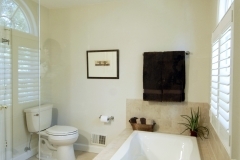 While homeowners in Alexandria, VA, are looking for the gorgeous bathroom remodel that makes one exclaim, “Wow,” they are still looking for clean, comfortable design. Whether it’s an addition or a remodel of an existing space, the designs and ideas are endless. One Alexandria resident transformed an attic into a bathroom – it was a clever way to add on to the home without requiring extra space. The practicality of a bathroom design should always be the primary focus, but these practical items don’t have to be just the basics. Carefully chosen amenities and detailing are what make the end product breathtaking. Some of the most practical, yet stunning, additions are built-in niches. Whether in the walls as storage cabinets for linens and toiletries, or in the shower as shelves or seats, niches lend interest and sophistication to a bathroom. A large tile shower featuring a recessed section with shelves gives you a place to store shampoos, soaps and razors, and it breaks up the length of the wall. It can be ergonomic, using the same tile as the shower, or it can be a feature point, using a complementary tile that is highlighted. The niche can add value from both a practical and an aesthetic standpoint. Alexandria homeowners are also finding that bigger showers are better. Minimum width should be three feet, but 3.5 feet is even better – you’ll notice the difference immediately upon entering or exiting. Minimum length is four feet. If you have the room to make it longer, by all means, do so. It creates a more friendly showering experience. Curbless showers and good lighting are also important for entering and exiting the shower, especially as we age. We recommend an exhaust fan and light combination with separate switches, so the two can be used individually or simultaneously. This will help remodel your bathroom, in an elegant way.